Diabetic patients who have poor circulation and nerve damage are most prone to foot problems, especially in cold weather conditions. Moisture from cold weather can collect in your shoes and socks, soaking your feet, leading to the propagation of bacteria and possibly an infection. Diabetic patients should remember to change their socks often when going out in cold weather, and to moisturize their dry feet. Avoid using warming aids on your feet, as this can be dangerous for patients who have numbness due to peripheral neuropathy. Properly-fitting shoes, combined with sufficient soles and moisture-wicking socks, are necessary to ensure proper care for diabetic patients. Diabetic foot care is important in preventing foot ailments such as ulcers. If you are suffering from diabetes or have any other concerns about your feet, contact Dr. Dean D. Hinners from Illinois. Our doctor can provide the care you need to keep you pain-free and on your feet. If you have any questions please feel free to contact one of our offices located in Metropolis and Eldorado, IL. We offer the newest diagnostic and treatment technologies for all your foot and ankle needs. If you find yourself engaging in vigorous activity, but only on the weekends, this is something you should be aware of. Injuries like Achilles tendonitis, or a ruptured Achilles tendon, can happen very quickly. For us non-professional athletes that don’t have time in our busy schedules to reach pinnacles of muscular strength, we are more susceptible to these acute injuries. 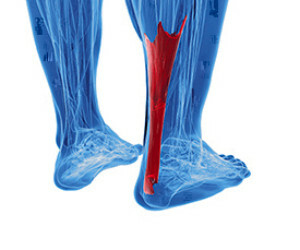 The Achilles tendon connects the heel bone to the calf muscles and is essential to being able to walk. If the tendon ruptures, surgery will be necessary in order to repair this very painful injury. Achilles tendonitis is when the tendon becomes inflamed, typically due to overuse or not stretching beforehand. Both of these conditions can be treated by a podiatrist and if you experiencing intense heel pain you should consult with one immediately. In order to avoid these injuries, strengthening the tendon by gradually stressing them over time may be helpful. And always remember to stretch! Achilles tendon injuries need immediate attention to avoid future complications. If you have any concerns, contact Dr. Dean D. Hinners of Illinois. Our doctor can provide the care you need to keep you pain-free and on your feet. If you have any questions please feel free to contact one of our offices located in Metropolis and Eldorado, IL. We offer the newest diagnostic tools and technology to treat your foot and ankle needs. Known as a chronic autoimmune disease, lupus and its symptoms are similar to that of arthritis, affecting the tissues in the joints and leading to various problems in the feet including bunions, claw toes, and hammertoes. Lupus can also lead to tendonitis, loss of feeling or neuropathy, muscle inflammation, corns and calluses, swollen feet or oedema, and more. It is especially important to watch lupus symptoms, as infections such as gangrene can develop in a healthy person. Visit your podiatrist to assess your condition, as well as invest in proper footwear with insoles. When dealing with systemic disease of the feet, it is extremely important to check the affected areas routinely so that any additional problems are caught quickly. If you have any concerns about your feet and ankles contact Dr. Dean D. Hinners from Illinois. Our doctor will assist you with all of your podiatric needs. Systemic diseases affect the whole body, and symptoms usually are displayed in the feet. This condition can make a patient’s ability to walk unbearable. Systemic diseases include gout, diabetes mellitus, neurological disorders, and arthritis. Gout – is caused by an excess of uric acid in the body. Common symptoms include pain, inflammation, and redness at the metatarsal/phalangeal joint of the base big toe. Gout can be treated by NSAIDs to relieve pain and inflammation, and other drugs that lower the acid levels in the body. Diabetes mellitus – is an increase in the level of blood sugar that the body cannot counteract with its own insulin. Failure to produce enough insulin is a factor in Diabetes. Peripheral Vascular Disease – can restrict the blood flow to the feet, and often times lead to amputation of the feet. Among foot conditions, corns and calluses are often seen as some of the more harmless concerns. Regardless, if either condition does become troublesome, there are methods available for removal. Because calluses are essentially small areas of thick, hardened skin, softening them can help aid in their removal. Soaking the feet in warm water and avoiding using harsh soaps while washing can help maintain softness of the skin. Hard areas can also be buffed away using a pumice stone. If you are suffering from corns or calluses and seek ways to remove them, consult with your podiatrist. If you have any concerns regarding your feet and ankles, contact Dr. Dean D. Hinners of Illinois. Our doctor will treat your foot and ankle needs. Treatment of corns involves removing the dead skin that has built up in the specific area of the foot. Consult with Our doctor to determine the best treatment option for your case of corns. Ingrown toenails are classified as the growth of the nails into the sides of the skin, resulting in symptoms of pain and irritation. Typically, surgery is considered as an option in helping to correct ingrown toenails, but the following at-home DIY procedure can help. The first step involves soaking your feet in warm water with baking soda and salt. Use a cotton ball soaked in raw honey and a garlic clove to apply space between the end of the nail and skin. The mixture has antiseptic properties and will help with the separation of the ingrown toenail. Do this for at least 15 days, then gradually work toward separating the toenail from the skin. Ingrown toenails can become painful if they are not treated properly. For more information about ingrown toenails, contact Dr. Dean D. Hinners of Illinois. Our doctor can provide the care you need to keep you pain-free and on your feet. Ingrown toenails occur when a toenail grows sideways into the bed of the nail, causing pain, swelling, and possibly infection. Because ingrown toenails are not something found outside of shoe-wearing cultures, going barefoot as often as possible will decrease the likeliness of developing ingrown toenails. Wearing proper fitting shoes and using proper cutting techniques will also help decrease your risk of developing ingrown toenails. Ingrown toenails are a very treatable foot condition. In minor cases, soaking the affected area in salt or antibacterial soaps will not only help with the ingrown nail itself, but also help prevent any infections from occurring. In more severe cases, surgery is an option. In either case, speaking to your podiatrist about this condition will help you get a better understanding of specific treatment options that are right for you. Arthritis is a very common disease that can affect joints in areas all over the body. Arthritis of the feet can be especially painful and debilitating due to the constant weight put on that section of the body. For someone with arthritic feet, every step taken can be excruciating. There are many different types of arthritis, though inflammatory arthritis can be one of the most devastating. Rheumatoid arthritis is one such type, where the cartilage of the joints is being destroyed. Though there is really no set diet to cure this illness, there are some recommended foods that may prove effective in helping mitigate some of the arthritic symptoms. The key is to reduce inflammation. Certain foods that help do just that are nuts, fish, and, dark vegetables. Arthritis can be a difficult condition to live with. If you are seeking treatment, contact Dr. Dean D. Hinners from Illinois. Our doctor can provide the care you need to keep you pain-free and on your feet. Arthritis is a joint disorder that involves the inflammation of different joints in your body, such as those in your feet. Arthritis is often caused by a degenerative joint disease and causes mild to severe pain in all affected areas. In addition to this, swelling and stiffness in the affected joints can also be a common symptom of arthritis. Massages can help temporarily alleviate pain. If you have any questions, please feel free to contact one of our offices located in Metropolis and Eldorado, IL. We offer the newest diagnostic tools and technology to treat your foot and ankle needs. There are over 100 different varieties of HPV, or human papilloma virus. Nearly 12% of the global population have had warts at one time, and plantar warts are but one of these types. They all share one basic characteristic, they have the ability to infect skin cells. Many people, when they hear the term HPV, think that it refers to genital warts. But this is not the case, and HPV can manifest itself in many different forms. Plantar warts occur on the feet, typically on the palms or the soles. They can be flat or raised, and usually occur in dry, cracked areas of the foot. Treatments vary in scope and effectiveness. If you think you may have a plantar wart, talk to your podiatrist and go through the treatment options available. Plantar warts can be very uncomfortable. If you need your feet checked, contact Dr. Dean D. Hinners from Illinois. Our doctor will assist you with all of your foot and ankle needs. Plantar warts are the result of HPV, or human papillomavirus, getting into open wounds on the feet. They are mostly found on the heels or balls of the feet. While plantar warts are generally harmless, those experiencing excessive pain or those suffering from diabetes or a compromised immune system require immediate medical care. Plantar warts are easily diagnosed, usually through scraping off a bit of rough skin or by getting a biopsy. To help prevent developing plantar warts, avoid walking barefoot over abrasive surfaces that can cause cuts or wounds for HPV to get into. Avoiding direct contact with other warts, as well as not picking or rubbing existing warts, can help prevent the further spread of plantar warts. However, if you think you have developed plantar warts, speak to your podiatrist. He or she can diagnose the warts on your feet and recommend the appropriate treatment options. The holidays would not be complete without the endless gathering of family and friends, enjoying vast amounts of delicious food, decadent sweets, and festive cocktails. However, self-indulging in these treats go hand-in-hand with a heightened risk of health problems. Not only does weight gain increase your risk for things like heart attack and stroke, but it affects your body on a musculoskeletal level. Individuals who may be overweight or obese must also take into account the extra pressure they are placing on their feet, in particular, their arch. The amount of force placed on our feet can cause much pain and damage to the ankle, leg, and hip due to improper weight distribution. It is important to always keep yourself on a good exercise routine to lower your risk of weight-gain, especially around the holiday season. Obesity has become very problematic at this point in time and can have extremely negative effects on the feet. If you’re an obese individual and are concerned about your feet, contact Dr. Dean D. Hinners of Illinois. Our doctor can provide the care you need to keep you pain-free and on your feet. Since your feet are what support your entire weight when standing, any additional weight can result in pain and swelling. Being overweight is one of the main contributors to foot complications. Extra Weight – Even putting on just a few extra pounds could create serious complications for your feet. As your weight increases, your balance and body will shift, creating new stresses on your feet. This uneven weight distribution can cause pain, even while doing the simplest tasks, such as walking. Diabetes – People who are overweight are at serious risk of developing type-2 diabetes, which has a drastic impact on the health of your feet. As you get older, your diabetes might worsen, which could lead to loss of feeling in your feet, sores, and bruises. You could also become more prone to various infections. Plantar fasciitis – Pressure and stress that is placed on muscles, joints, and tendons can trigger plantar fasciitis, which is an inflammation of tissue that forms along the bottom of the foot. If you have any questions please feel free to contact our offices located in Metropolis and Eldorado, IL. We offer the newest diagnostic and treatment technologies for all your foot and ankle needs. Arthritis and aching joints are one of the most prevalent complaints of people 55 years and over. Dr. Kendra Zuckerman of Main Line Health states, “arthritis technically means an inflammation of the joints.” Deborah Wolf, 76, shares her time between practicing law and playing tennis, and is not ready to slow down her rigorous schedule. However, after the development of arthritis in her knees, activity has become difficult. Dr. Zuckerman advises that exercise and weight-watching is important for arthritic patients, and that anti-inflammatory drugs can also help with the pain, too. Deborah works on knee strengthening and diet-planning to keep her pain at bay. Proper foot care is something many older adults forget to consider. If you have any concerns about your feet and ankles, contact Dr. Dean D. Hinners of Illinois. Our doctor can provide the care you need to keep you pain-free and on your feet. As we age we start to notice many changes in our body, but the elder population may not notice them right away. Medical conditions may prevent the elderly to take notice of their foot health right away. Poor vision is a lead contributor to not taking action for the elderly. Neuropathy – can reduce feeling in the feet, and can hide many life threating medical conditions. Reduced flexibility – prevents the ability of proper toenail trimming, and foot cleaning. If left untreated, it may lead to further medical issues. Diabetes and poor circulation can cause general loss of sensitivity over the years, turning a simple cut into a serious issue. If you have any questions, please feel free to contact our offices located in Metropolis and Eldorado, IL. We offer the newest diagnostic tools and technology to treat your foot and ankle needs. “If you want to know the state of your health, try looking down.” Poor circulation in a person’s feet can be caused by a variety of things, and it is vitally important not to ignore any hint that this may be happening to you. Symptoms to look out for include cold feet, numbness, pain, or swelling. Diabetes can lead to poor circulation in the extremities and if left untreated, can wreak havoc on your feet. But there are many other reasons for lack of blood flow, including neurological issues, Peripheral Artery Disease (PAD), and smoking, among others. Causes of these symptoms can become serious so it is imperative get to a podiatrist immediately to find out what is going on. Poor circulation is a serious condition and needs immediate medical attention. If you have any concerns with poor circulation in your feet contact Dr. Dean D. Hinners of Illinois. Our doctor will treat your foot and ankle needs. As winter approaches we all know how important it is to make sure to keep our skin from getting too dry. Just as we use balms and moisturizers for our face and hands, there are many ways to protect against dry and cracked feet and heels. Glycerin lotions are some of the best remedies for combatting dryness. Hydrogenated oils are also very effective moisturizers, and can be used not only on your feet, but your ankles and legs too. In addition, fruits like banana and pineapple have plentiful amounts of helpful enzymes to ensure smooth and crack-free feet and ankles. Cracked heels are unsightly and can cause further damage to your shoes and feet. If you have any concerns, contact Dr. Dean D. Hinners of Illinois. Our doctor can provide the care you need to keep you pain-free and on your feet. Eating healthy, with a well-balanced diet, will give the skin a fresh and radiant look. Your body responds to what kinds of food you ingest. Omega-3 fatty acids and zinc supplements will also help with skin tissue. Most importantly seek a health professional for foot care if something is wrong or doesn’t seem to be working. A podiatrist will help you with any questions or information needed. Read more about cracked heels. Tarsal tunnel syndrome can occur as a result of compression of the tarsal tunnel, “a canal at the inside of your ankle that houses tendons (what connects muscle to bone) and your tibial nerve.” Symptoms of the syndrome can include burning, aching and sudden pain in and around your ankles and feet. Causes of the syndrome range from flat feet, constant strain on your ankles and feet and an anatomic anomaly where there is too little space for the tibial nerve. Treating your tarsal tunnel syndrome involves physical therapy, custom orthotics and massages around the affected area. Tarsal tunnel syndrome can be very uncomfortable to live with. If you are experiencing tarsal tunnel syndrome, contact Dr. Dean D. Hinners of Illinois. Our doctor can provide the care you need to keep you pain-free and on your feet. Tarsal tunnel syndrome, which can also be called tibial nerve dysfunction, is an uncommon condition of misfiring peripheral nerves in the foot. The tibial nerve is the peripheral nerve in the leg responsible for sensation and movement of the foot and calf muscles. In tarsal tunnel syndrome, the tibial nerve is damaged, causing problems with movement and feeling in the foot of the affected leg. -Involves pressure or an injury, direct pressure on the tibial nerve for an extended period of time, sometimes caused by other body structures close by or near the knee. -Diseases that damage nerves, including diabetes, may cause tarsal tunnel syndrome. -At times, tarsal tunnel syndrome can appear without an obvious cause in some cases. -Different sensations, an afflicted person may experience pain, tingling, burning or other unusual sensations in the foot of the affected leg. -The foot muscles, toes and ankle become weaker, and curling your toes or flexing your foot can become difficult. -If condition worsens, infections and ulcers may develop on the foot that is experiencing the syndrome. A physical exam of the leg can help identify the presence of tarsal tunnel syndrome. Medical tests, such as a nerve biopsy, are also used to diagnose the condition. Patients may receive physical therapy and prescriptive medication. In extreme cases, some may require surgery. Read more about tarsal tunnel syndrome. The number of cases of hand, foot and mouth disease (HFMD) are on the rise, especially among children at schools, as the disease is highly contagious. School administrators at the Ministry of Health advise that children who have the disease stay at home “for at least seven days.” Additionally, they advise that any immediate objects in the school environment should be cleaned frequently to help reduce the spread of the virus. Good hygiene as well as caution during close contact should be encouraged among your children to help toward prevention of HFMD. Making sure that your children maintain foot health is very important as they grow. If you have any questions, contact Dr. Dean D. Hinners of Illinois. Our doctor can provide the care you need to keep you pain-free and on your feet. It is of paramount importance that your shoes properly fit your feet. For a proper fit, your feet should feel snug, but not pinched, and your toes should have a little bit of wiggle room. Unfortunately, inexpensive shoes typically do not offer the kind of cushion and support that can help prevent injury. Assessing the risk of injury when buying inexpensive shoes should determine the importance of comfortable, supportive shoes. Depending on whether you are running, hiking or just walking around, finding the right shoes can make a noticeable difference in your everyday life. Finding a properly-fitting shoe is important in reducing injuries and preventing foot problems. For more information about treatment, contact Dr. Dean D. Hinners of Illinois. Our doctor can provide the care you need to keep you pain-free and on your feet. Keeping in mind how shoes fit the biomechanics of your body, properly-fitting shoes are vitally important. Fortunately, it is not difficult to acquire footwear that fits correctly. Be sure to wear shoes that support the overall structure of your body. Do your feet a favor and invest in several pairs of well-fitted shoes today.